I have just returned from a fantastic week in Antalya, Turkey as a guest of the Turkish Paramedic Association. I was honoured to have been a member of the scientific committee, and an invited speaker at this event, where I spoke about international perspectives of pre-hospital care in the Republic of Ireland and the United Arab Emirates, and on the topic of paramedic education and social media. With Team Giresun – my unofficially adopted Turkish team! 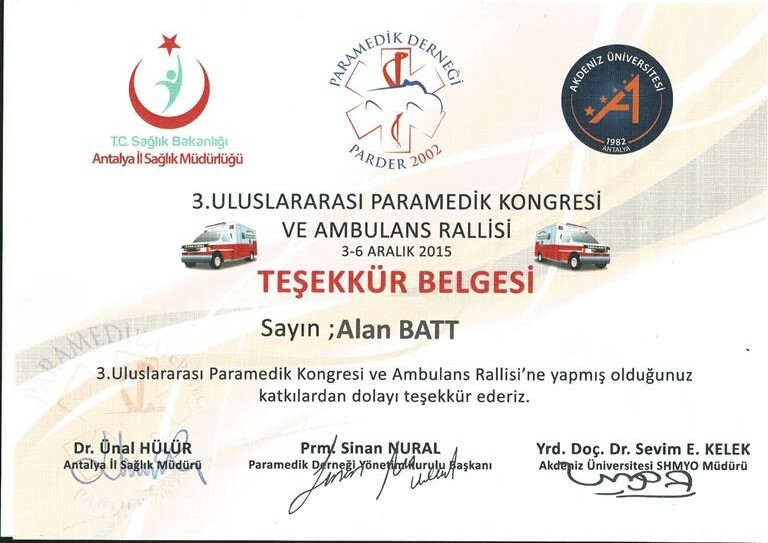 The ambulance rally consisted of 47 teams from all across Turkey and internationally, including Canada, UK and Germany. Teams competed against the clock in four simulated clinical scenarios which included a mass casualty triage incident and medical and trauma scenarios. Stations were held across the hotel complex where the event was being held, even on the nearby beach! Team Canada (above) and Team Germany 1 (below) during the ambulance rally. We were even treated to an impromptu Turkish dance party on the night of the rally competition awards ceremony! The entire week we were greeted with warm, friendly welcomes from all Turkish attendees, and they were eager to learn from us and share their knowledge and experiences with us. The scientific programme took place over two days and consisted of international topics such as education, self-regulation and research, as well as sessions on critical care, disaster, tactical and community paramedicine. Sessions were delivered in Turkish or English, with simultaneous translation, allowing for all to participate in the information sharing. Thanks to all the competitors, supporters, speakers, the Turkish Paramedic Association and the organising committee for a truly enjoyable and interesting week. Did I mention all of this took place in an all-inclusive beachside resort? It’s a tough post, but somebody had to do it! I strongly encourage all paramedics and EMTs to consider attending next year’s event, ideally as members of a team to compete in the ambulance rally. If you need further information, please feel free to contact me! My name is Ehsan Atouni working as a paramedic for EMS of Iran. I do not know why my country did not join this rally and it makes me sad. I would like to join this rally for next year. How can I do that? Show me the way please.